The junior Shankarachraya got some relief today as the Madras High Court granted conditional bail to him and stated that there was insufficient evidence to establish the charge of conspiracy against him in the Sankararaman murder case. The Indian Air Force (IAF) will shortly sign a contract with Hindustan Aeronautics Limited and the DRDO for the supply of 20 Tejas Light Combat Aircraft (LCA) with an option of an additional 20, in what will become the first IAF contract for an indigenous combat aircraft in several decades, following the demise of HF-24 Marut. Miss India Universe 2004 Tanushri Dutta at the inaugural function of the National Institute of Fashion Design in Bhopal on Wednesday. The spectre of sanction laws over both buyer and seller notwithstanding, requests for information has gone out from the Indian side, and top American defence equipment companies at Aero India are lining up a variety of products for sale to Indian armed forces, including an unmanned, completely programmable helicopter from the house of Northrop Grumman (NG). A native of Punjab whose allegations of corruption had forced the Canadian Immigration Minister to step down has been deported to India after a federal court rejected his claims for staying on in that country. The Supreme Court has sought a status report from the Centre and the BSF on reported presence of the paramilitary force’s ex-personnel Surjit Singh from Punjab in the Kot Lakhpat Rai jail in Pakistan, whom the government had declared dead in the 1971 war. Even as several teams of the Crime Branch of the Delhi police have started investigation to identify the assailant who tried to eliminate S.A.R. Geelani on February 8, the police is still waiting to talk to the victim to get his statement recorded. Without giving a firm commitment about releasing the Nanavati Commission report on 1984 anti-Sikh riots, Union Home Minister Shivraj Patil today said it would be made public in due course. Prime Minister Manmohan Singh has approved a list of "Policy Thrust Areas" for 45 major ministries and departments of the government, including the PMO. Two Sikh girls eloped with a couple of Hindu boys sparking arson and clashes between members of the two communities in Chhattisgarh's Dongargarh town, 110 km from here, prompting imposition of curfew today. The Central Bureau of Investigation (CBI) today booked a case against four persons, including Anees Ibrahim, the brother of underworld don Dawood Ibrahim, in the "gutkha" case. The four persons against whom the CBI registered cases were identified as Zamurrduin Ansari, Rajesh Panchariya, Mohammad Farooq Mansurian and Anees Ibrahim. Environment will be made a compulsory subject from Class I to XII in Central Board of Secondary Education (CBSE) schools this year. Six Punjab police commandos were injured when a police vehicle carrying them overturned near Khedaspura Badki Canal in Gaya district of Bihar today, the police said. Mr Justice M. Thanikachalam granted bail exactly a month after Sri Vijayendra was arrested on the same afternoon after the Supreme Court had given bail to Sri Jayendra Saraswati. While the Supreme Court had held that there was no worthwhile evidence against the Shankaracharya Sri Jayendra Saraswati, the Madras High Court today held that the materials relied upon by the prosecution against the junior seer were inadequate, slim and lacked corroboration. Sri Vijayendra Saraswati was not present in the court as he was taken to the Kancheepuram judicial magistrate’s court from the Chennai central prison. However, he will be released only tomorrow as some formalities needed to be complied with. Mr Justice Thanickachalam granted him bail on the condition that he execute a bond for Rs 50,000, along with two sureties for a similar sum, before the Chief Judicial Magistrate, Chengalpattu. He has been forbidden to leave the city unless required to attend a court hearing and report to a local police station here every Sunday. He was also asked to surrender his passport, if he had one, and give an undertaking that he would not tamper with evidence or seek to influence witnesses. The prosecution’s case was that the junior seer had carried out the senior Shankaracharya’s directives through his brother, Raghu, and was involved in the conspiracy and murder. But the prosecution failed to produce sufficient details to prove its contention that a demand draft had been drawn from the mutt’s account in favour of a company owned by a real estate developer, Mr Ravi Subramaniam, an approver in the case. On other materials submitted by the prosecution before the court to prove that the killers had been paid from related bank accounts, the Judge observed that those, too, failed to give any support to the case against Sri Vijayendra. The court also expressed doubts about three cheques shown to the Judge as further evidence as they were all dated prior to September 1, 2004, when the prosecution alleged the conspiracy was hatched. Sankararaman was hacked to death inside the Varadaraja Perumal temple on September 3 last year. 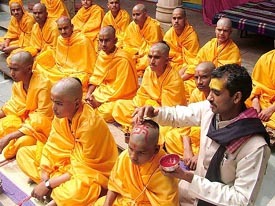 Referring to the apex court’s order while granting bail to the Shankaracharya, he said, “In that case, the materials relied on to rope in this petitioner, are not so strong as that of the first accused, and the role said to have been played by the junior pontiff is very limited, even according to the prosecution. Kancheepuram (UNI): Amidst speculations that there was a rift, the first meeting between the two Kanchi Shankaracharyas since the arrest of senior seer Jayendra Saraswati on November 11 last, not only had a sense of bonhomie and camaraderie, but also several firsts to it. There were reports that differences existed between the two seers. This was heightened if the alleged statements of the senior seer during the custodial interrogation were to be believed. The video footage containing a portion of the senior seer’s interrogation, were telecast by some private TV channels. The Chief of Air Staff, Air Chief Marshal S.P. Tyagi, making the announcement at Aero India here today, said each aircraft will cost Rs 100 crore. It would be difficult to come up with a time frame for the actual formation of the squadron, but he was looking at 2008-2012 for the deliveries, he added. The IAF was not looking at any other aircraft in the light fighter category, and the projected requirement for 126 Multi-Role Combat Aircraft for which an international Request for Information (RFI) had gone out was in the 20-tonne class, he said. India has already signed an agreement with General Electric Corporation of the USA, also cleared by the US State Department, after sanctions were lifted, for the supply of 40 GE-404 engines to power the LCA. The Indian Air Force (IAF) had already cleared a list of weapons to be integrated into the platform, he confirmed. Hindustan Aeronautics Limited (HAL) Director (Design and Development) Yogesh Kumar said HAL had completed developing the algorithms for the weapons systems integration and these were being loaded into the Mission Computer for the second prototype vehicle (PV-2) which is to fly in a couple of months. PV-2 will be the fourth LCA to fly along with PV-1 and the first two technology demonstrators (TD). 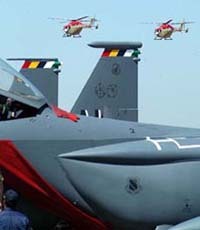 All three LCAs are featuring in Aero India 2005. TYPHOON RULED OUT: The RFIs for the 126 MCRAs had not targeted the Eurofighter Typhoon, as it was not in the class that the IAF was looking for, he said. This unusual, ‘autonomous’ helicopter is being developed for the US Army and the US Navy. This helicopter, based on a commercially available platform from Schweitzer, has no pilot’s joy stick and will be flown completely by a computer into which various parameters can be programmed in such a way that it can perform anything from reconnaissance to rescue missions. Dubbed the ‘Firescout,’ this helicopter, version RQ-8B, has already logged over 140 hours of flight time. A ship deck landing will be tried out soon, NG Unmanned Systems director George Smith told The Tribune. Depending on the payload, the chopper can cover distances of 700 miles. “The idea is to make it in such a way that it can be turned around for different missions by putting in different systems. A radar for airborne early warning in one role, stripped for rescue mission, border patrol, etc. Nothing like it is in existence.” It is expected to be inducted into the US forces in 2008. The US Navy will fly it off small combat ships known as the LCS — Littoral Combat Ship. The other system that NG is offering is a Hawkeye 2000 airborne early warning fixed-wing aircraft that can be flown off land or an aircraft carrier. The Indian Navy last October asked for `price and availability’ information for six Hawkeyes, and this has been responded to, company officials stated. NG conducted an assessment exercise to see if it could be flown off INS Vikramaditya, formerly Admiral Gorshkov, the Russian aircraft carrier currently in the acquisition process. Harjit Singh (49) landed in New Delhi last week a few days before Hindi cinema actress Negar Khan was asked to leave the country in similar circumstances. A Canadian High Commission official told The Tribune that Harjit Singh was deported on Thursday last. He had been staying in Canada as a visitor for the past 17 years. He had also been in detention for the last few weeks leading up to his deportation. Harjit Singh, who ran a pizzeria near Toronto, was in the centre of a row for alleging that the minister had promised to help him stay on in Canada if he supplied free pizzas for her election campaign. The controversy forced the minister to eventually step down last month. Harjit Singh had arrived in Canada in March 1988. Since then, he has sought to stay on in that country first as an asylum seeker and then as a refugee. His claim for seeking refugee status on the ground of maltreatment was turned down. Taking advantage of the liberal immigration laws in Canada, Harjit Singh had persisted with his court battles. He was, however, refused residency after Canadian immigration authorities found out that he had been accused of certain offences in India. The Canadian High Commission official said under the Canadian system, people wanting to stay in that country are afforded a number of reviews (refugee determination, leave to federal court, humanitarian and compassionate considerations). “If at the end of the process, the answer is that the person is required to leave Canada; it is the mandate of the Canada Border Services Agency to carry out the removal. According to Punjab’s Principal Resident Commissioner J.S Maini, Harjit Singh’s whereabouts are uncertain. ‘‘He must have been picked up by immigration officials for interrogation after he landed at the Indira Gandhi International Airport’’, Mr Maini said. “Taking into account the peculiar features of the case, we direct the opposite parties to look into the grievance of the petitioner within a period of four weeks and file a status report by the next date,” a Bench of Mr Justice Arijit Pasayat and Mr Justice S.H. Kapadia said. The court issued the direction to the Ministry of Home Affairs to submit the report on a writ petition by Surjit Singh’s wife Angrej Kaur, claiming that her husband was lodged in the Pakistani jail and one Khushi Mohammad of Malerkotla, released from there after 14 years in September last year, had met him in the prison. Seeking direction to the Union Government to take up the issue of her husband and other Indian prisoners’ release with Pakistan, Angrej Kaur in the petition, filed by her counsel Abha Jain, said as per Mohammad’s statement, published in the media, at least 85 Indians, mainly soldiers captured during 1971 war, had been languishing in jails in that country in “pitiable conditions”. She said her son Amrik Singh had met Khushi Mohammed after his return from Pakistan and showed him the photograph of his father, which the released prisoner had immediately identified and confirmed of having seen him in the Kot Lakhpat Rai jail. Another released prisoner Jagjit Singh confirmed the same. Since the police has not spoken to him since the incident took place and was only hearing allegations from other quarters, talking to Geelani assumes greater importance as the police might get some leads in the case. The police also refuted all charges levelled by Ms Nandita Haskar and termed these as totally baseless. Ms Haskar was the one who rushed him to the hospital after the attack. The police is now probing whether the attack was the handiwork of the rival militant outfit or it was merely stage-managed. Besides, the personal angle of Geelani is also being probed to ascertain if he had any enmity with anyone, which led to the murderous attack. The police is under pressure in view of the Supreme Court seeking a report within a week on the progress in the investigation into the case. “The document will be made public in due course as per the set procedures,” Patil told reporters on the sidelines of the fourth annual conference of state minorities commission here. When asked what could be the possible date for making public the report, submitted to him by Mr Justice G.T. 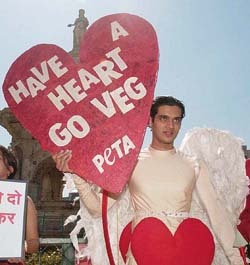 Nanavati yesterday, Mr Patil said “the government has nothing to hide”. The PMO and the Press Information Bureau put up the 'policy thrust areas' on its respective websites today. The implementation of policies under these thrust areas, based on the list approved by the Prime Minister, would be reviewed by the Prime Minister's Office on a regular basis, a PMO official said. The ministries are being asked to prepare a schedule of sequential steps with time frames for each thrust area, so that progress can be benchmarked against these. This list has been drawn up in consultation with the respective ministries. It is based on the major commitments of the National Common Minimum Programme, the commitments made by the government through the President's Address to Parliament last year, the Union Budget speech of 2004-05, and the Prime Minister's announcements through his various speeches. Some of the important 'policy thrust areas' include: proactive engagement with neighbours with a view to improved border management and emphasis on related infrastructure development, implementing the J&K Reconstruction Plan, tackling terrorism in the north-east and J&K and finalise within next six months the approach to rehabilitation of Tsunami-affected persons. A mob set ablaze half a dozen shops and attacked several people yesterday protesting the alleged failure of the police to recover the two girls who allegedly eloped with their paramours a few days back, forcing the authorities to clamp curfew. In fresh violence this afternoon, when curfew was relaxed, a mob of 30 ransacked two shops belonging to Sikhs. The missing girls had left a message, recorded in a CD, giving reasons of their leaving home and plan to get married to the local boys with whom they allegedly had an affair for some time. The families of the girls lodged a complaint with the police against the two boys. But as no clue about the whereabouts of the missing girls was found, the parents, along with their neighbours, gathered in the town yesterday evening. A mob laid a siege to the houses of the boys named in the complaint and resorted to rioting, attacking local shops and other establishments. The mob raised slogans against local BJP MLA Vinod Khandekar and tried to manhandle him but he took shelter in a hospital. Considering the gravity of the situation, curfew was imposed last evening. The Central Bureau of Investigation (CBI) today booked a case against four persons, including Anees Ibrahim, the brother of underworld don Dawood Ibrahim, in the "gutkha" case. The four persons against whom the CBI registered cases were identified as Zamurrduin Ansari, Rajesh Panchariya, Mohammad Farooq Mansurian and Anees Ibrahim. The accused persons have been booked under various Sections of the Indian Penal Code, Arms Act, the MCOCA for alleged smuggling of the machinery to Karachi and for extortion in the case. After registering the case last evening, a four-member CBI team led by a DIG has left for Mumbai for carrying out the investigation. The CBSE decision follows a Supreme Court judgement directing educational agencies in the country to make environmental education a compulsory component of the system from the current academic year. CBSE Academic Director G Balasubramanian told UNI today that the NCERT had already brought out a curriculum for all classes from I to XII in compliance with the apex court directions.